At its type locality on Punta San Hipolito, the San Hipolito Formation has an outcrop area of 20 square kilometers and is in fault contact with the Cretaceous Valle Formation to the northeast (Mina, 1957). Beal (1948) included the "quartzites, cherts, cherty limestones and igneous rock" of Punta San Hipolito in his San Fernando formation of Cretaceous age, but he mentioned that the rocks were possibly older than Cretaceous. Mina (1957) formally named the San Hipolito Formation and divided it into two parts, a lower part consisting of 1,000 meters of "cherts and sandstones" and an upper part consisting of 800 meters of "calcareous sediments" Mina (1957) noted that the lithologic characteristics or the San Hipolito Formation have a marked similarity to the Franciscan Complex. Rocks that appear to be equivalent to the San Hipolito Formation are found in the vicinity of Punta Morro Hermoso (Figure 1). At this locality, several hundred meters of red chert and green silicified tuff overlie pillow lavas. Gray, radiolarian-bearing limestone is found among the pillow lavas at this locality. The pillow lavas overlain by cherts and tuffs are not to be confused with the pillow lavas overlain by Buchia piochii bearing sandstones of the Jurassic Eugenia Formation found by Robinson (1975) in the same general area. Other outcrops similar to those found on Punta San Hipolito are found on the coast and on the islands of west central Baja California (see Figure 1). These include outcrops of red chert on Isla Asuncion and Isla San Roque reported by Hanna (1925), outcrops of basic volcanic rocks on Punta Asuncion (Troughton, 1974), and outcrops of radiolarian chert, graywacke, lava, blueschist and serpentine on the Islas San Benito (Cohen and others, 1963). A rock assemblage similar to the one on the Islas San Benito crops out on the southern part of Isla Cedros (Kilmer, 1968). Hanna (1925), Cohen and others (1963), and Kilmer (1968) note the lithologic similarity of these rocks to the Franciscan Complex. However, until fossils are identified, it can be assumed that they may be equivalent to the Triassic San Hipolito Formation. The Valle Salitral, or Valle Formation, is in contact with the San Hipolito Formation to the northwest. It was named by Mina (1957) for approximately 3,000 meters of sandstone, shale and conglomerate measured on the Vizcaino Peninsula. Robinson (1975) has measured 9,300 meters of Valle Formation on the Vizcaino Peninsula. On Punta San Hipolito, the Valle Formation consists of deeply weathered alternating graded beds of light brown mudstone and light to dark brown, fine tocoarse-grained graded concretionary lithic arkose to feldspathic volcanic arenite. Although bedding in the Valle Formation can be seen distinctly in aerial photographs, the formation is so deeply weathered in this area that only dark brown concretionary sandstone is visible on the surface. Outcrops of the Valle Formation are found on Cedros Island to the north and extend southward throughout the Cape Vizcaino Peninsula to Punta Abreojos (Mina, 1957; Figure 1). Fossils from the Valle Formation range in age from Albian through Campanian (R. G. Gastil, personal communication, 1975). 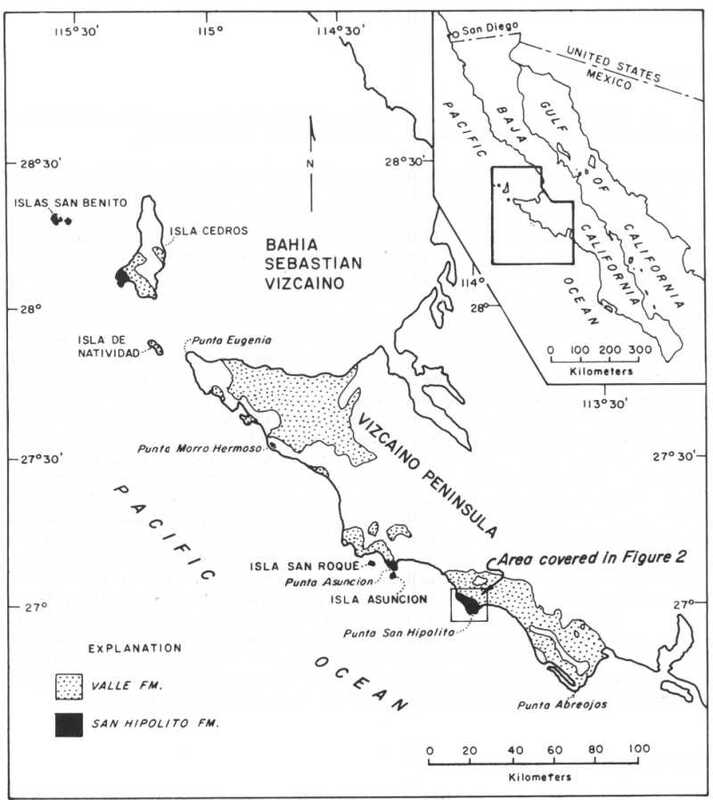 Beal (1948) points out that Lindgren (1890) was the first to mention a zone of uplift extending along the west coast of Baja California from Santa Margarita Island in Magdalena Bay northwestward through the Cape Vizcaino area to Cedros Island. Beal named this structural feature the "western marginal uplift" and states that the oldest rocks in these areas crop out on the coast or on the nearby islands offshore and that faults along the western coast of the Vizcaino Peninsula are "mostly upthrown on the west side." Beal (1948) concludes that the western part of the Vizcaino Peninsula "must lie near a disturbed zone of considerable importance." Mina (1957) observes that the major faults on the Vizcaino Peninsula, including the San Hipolito fault, trend northwest, which is parallel to the coast. Major folds also trend northwest on the Vizcaino Peninsula, including the San Hipolito Anticline, which is northeast of Punta San Hipolito (Mina, 1957). Mina (1957) feels that the San Hipolito fault and the major faults north of Tortugas Bay are in the same fault zone because the faults: (1) trend in the same direction, (2) are upthrown on the west side, and (3) dip to the southwest. The fault zone may extend through the San Benito Islands (Cohen and others, 1963) and northwestward into the continental borderland (Krause, 1965).